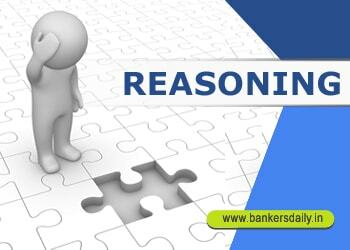 Reasoning section is one of the easiest scoring part in the recently over IBPS CLERK Prelims Exam 2017 and also the IBPS CLERK MAINS Examination 2017. So this could be a major breakthrough for your scores in the exams, so concentrating more on this topic will lead you to score more in this particular section where the time needed is very less when compared to the other sections. We are providing daily questions based on various topics from the reasoning section and you can practice the same to score more in the forthcoming exams. 1. 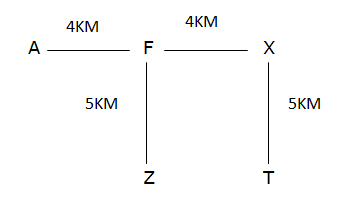 Point A is 4m to the west of Point F. Point Z is 5m to the south of Point F and Point X is 5m to the north of Point T. Point X is 4m to the east of Point F. What is the distance between the Point A and Point X? 2. A man starts from his house and walking towards east and then turned to his right and reaches bus stop and then walk towards west to reach railway station. Railway Station is in which direction with respect to his house? 3. 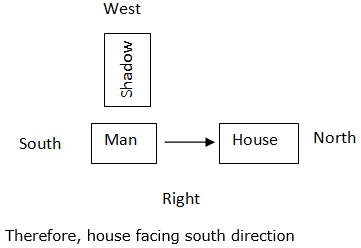 A man facing his house in the morning, his shadow will towards his left. Then his house is facing which direction? 4. Mr.A walking towards south and then take a left turn and takes 90 degree towards his right to reach the Shop. 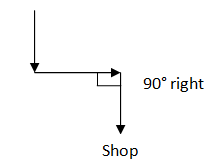 Then Shop is in which direction with respect to A’s starting point? 5. A clock shows 3’O clock. If an hour hand is towards south. Then minute hand is in which direction at 3.50? 6. 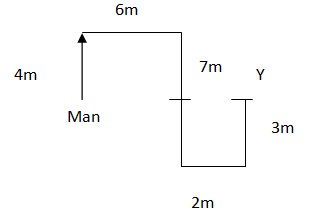 A man walking 4m towards north and takes right turn and again takes right turn after waking 6m and then walks 7m. Then he walk 2m towards his left and takes left turn and walks 3m to reaches point Y. 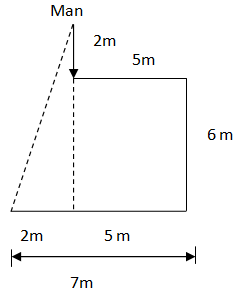 What is the distance between Man’s starting point and point Y? 7. Abi is sitting North east of X-man. Yasir sits south west of Abi. Chitra is sitting perpendicular to both Abi and Yasir. Yasir is not between X-man and Abi. 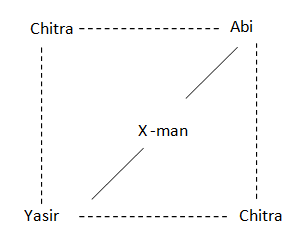 Chitra is in which direction with respect to X-man? 8. A direction board shows wrong directions. 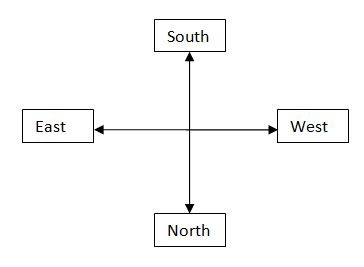 A board shows east for west, north for south and vice versa. If a man really wants to walk towards south then according to the board a man choose which direction to reach the correct destination. 9. 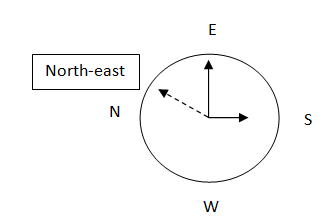 A man is facing towards east and turns through 180 degree clockwise , again 90 degree clockwise and turns through 135 degree in anti-clockwise direction. In which direction is he facing now? 10. A man walking 2m towards south and then he turns to East and walks 5m. Again he turns to south and walks 6m, after this he turns to West and walks 7m. How far is he from his starting point? 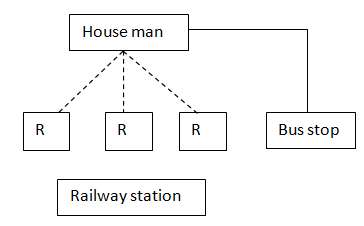 Railway station may be any three of the direction with respect to man’s house. Shop is in the south-east direction with respect to A’s starting point. There is two possibilities to place Chitra. 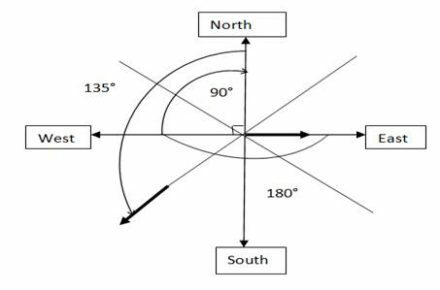 The man has to select North direction to reach his correct direction. Finally the man faces the south-west direction.